This system allows you to electronically adjust pre-load at the rear shock for one-up, two-up or two-up with luggage and then separately adjust the rebound damping between three levels: sport, normal, comfort. Ploss (BMW's head of chassis development) ,explained that a separate ECU is dedicated to Dynamic ESA, and it is fed information from various systems and sensors on the bike. The key sensors are potentiometers that measure position of the suspension front and rear, as well as the velocity at which the units are compressing or extending. 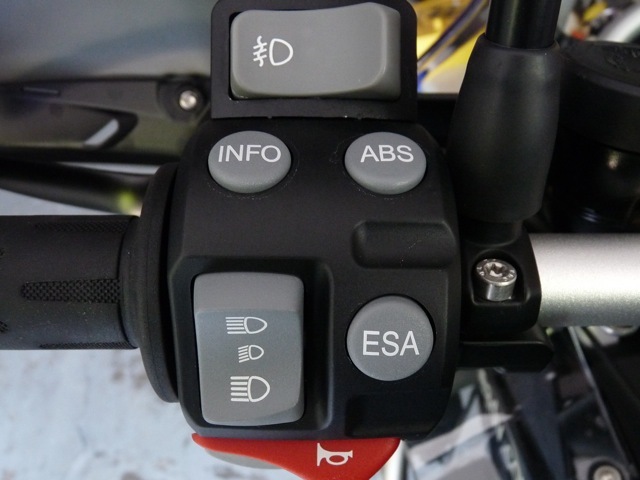 While the HP4 sportbike’s semi-active system uses a potentiometer only at the rear, use of two potentiometers on the all-terrain GS gives the system better information about the attitude of the bike. Information from the ABS and a lean-angle detector are also used to influence the damping-control valves contained in the heart of the front and rear shocks. The system will, for example, tighten rebound on the front shock on corner exits to help control chassis pitch and also increase overall damping when braking hard. Damping also gets more taut as lean angle increases. The valves, buried in the hearts of the shocks, were first used on the previous-generation 7 series sedan. In fact, they’re still in use in the M3 and M5 cars. Operation is by a solenoid that pulls the control valve against spring pressure. If there is no electric signal, maximum damping control is at play. Applying current moves the control valve progressively to reduce damping. The system reacts almost instantly, whether you clamp hard on the brakes, hit deep lean or select Soft, Normal or Hard ESA settings using the left-handlebar switch. The change from Hard to Soft settings is quite noticeable, but you are unlikely to detect the operation of the system overall, except in perhaps how well-controlled and planted the chassis feels in all riding conditions. The second generation "Electronic Suspension Adjustment", or ESA II, allows the suspension to be adjusted very comfortably and adapted to the riding mode and load. The selectable characteristic curves for suspension and damping enable a previously unknown degree of adjustment of the chassis to road conditions and load with the greatest possible operating comfort. This system, which is unique within the motorcycle market, allows the driver to adjust both the rebound-stage damping of the front and rear spring struts and the spring mount ("spring preload") of the rear spring strut, but also its spring rates and therefore the hardness of the spring by electronic means. This is achieved in a convenient way by means of the multi-controller in conjunction with the menu guidance on the TFT colour display. To keep operations as simple as possible and to prevent mistakes when setting the suspension, to begin with the rider only enters the loading status ("solo", "solo with luggage" or "with passenger and luggage"). The adjustment of the relevant spring mount or spring rate is then automatic, with the system coordinating both of these values. In addition, the rider selects the "Comfort", "Normal" or "Sport" damper setting and therefore the required suspension character of the machine. Working with these specification, the electronic controller uses the optimum parameters to calculate the appropriate damping rates and uses an electric motor to set these on the spring mount. In total, there are nine different variants available. The damping rate is changed by means of small stepper motors on the dampers. The additional adjustment of the spring rate allows the level of the motorcycle to be perfectly adjusted to different loading states and thus ensures an even higher degree of stability, maneuverability and comfort. Even under maximum loading conditions, with passenger and luggage, full cornering clearance is maintained, enabling a sporty riding mode. In addition, the adjustment of the spring rate significantly reduces the danger of drifting under extreme loads. It is possible to change the damper setting ("Comfort", "Normal" or "Sport" ) at the press of a button, even while moving. For functional and safety reasons, the spring mount can only be changed when stationary. An electric motor with transmission is used to vary the spring rate. The change in spring rate is facilitated by two springs switches in series. An elastomer element (Cellasto) in combination with a conventional helical spring below absorbs the forces during compression. The radial outward expansion of the Cellasto element is permanently limited by a steel sleeve. On the inside, an electro-hydraulic mechanism is used to move an aluminium sleeve. The position of the inner sleeve influences the inward expansion of the Cellasto element and therefore its spring rate. This has the same effect as the use of two springs of different strength. If the inner sleeve sits on the steel spring, the Cellasto element will not function and only the steel spring will work. If the internal sleeve is then moved, it is also possible to vary the spring mount of the steel spring, in other words the "spring preload". The enables the static normal position and the rising geometry to be maintained to optimum effect in all loading states. The additional adjustment of the spring rate over the broad range from 110 to 160 N/mm made it possible to spread the "Comfort", "Normal" and "Sport" settings broadly for ESA II, thereby clearly influencing the riding mode. The advantage of electronic suspension setting with ESA over a conventional mechanical setting is the fact that all suspension components are immediately coordinated, so that "normal users" can avoid errors. This will enable riders to avoid the need for awkward and time-consuming manipulation of tools, instead of which they can make the adjustment conveniently within seconds at the press of a button. This makes it possible to adjust the suspension even at short notice, for example when spontaneously carrying a passenger or when the characteristics of the terrain suddenly change. Comfort, Normal, and Sport settings allow you to change rebound damping on the front suspension, and rebound and compression damping in the rear while you’re riding. Best Example of Use: Riding highways on a cool morning, the “Comfort” mode was perfect. But a few hours later, 90+ Fahrenheit temperatures must have thinned out the shock’s oil, and the bike was bouncing and “wallowing out” too much. Just hitting the ESA button a couple of times to select “Normal” mode fixed this instantly. Later on we were in some twisties, and the bike was rocking back and forth a bit coming in and out of corners. A couple of clicks of that ESA button to “Sport” steadied the bike and made it carve through each turn with absolute precision. So cool! Shock preload adjustments (that have to be adjusted while the bike isn’t moving) offer up multiple combinations for a single rider, rider with luggage, riding 2-up, and the 2 firmest settings meant to handle extreme compression needs in tough terrain. This basically compensates for extra weight or stiffening needs by applying pressure to a piece of elastomer within the shock assembly. 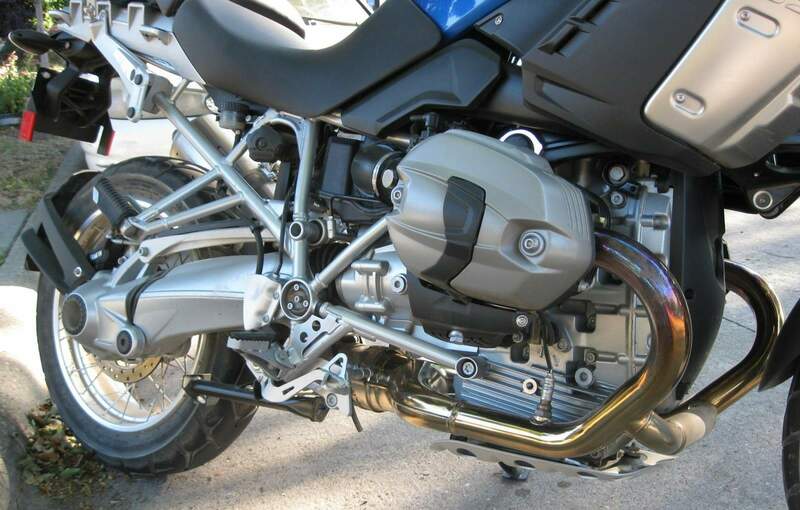 Best Example of Use: As with many motorcycles, BMW figured the “typical rider" to be about 175 lbs., and the R1200GS’s suspension was set up accordingly. If you weigh more than this or are routinely changing your luggage and passenger situation, just hit the ESA button and adjust accordingly. You’ll see the ride height of the bike change while it’s parked and making it’s adjustments, as your bike can move upward significantly during adjustment. It won’t take long to memorize exactly which damping and preload combinations work best for the ride you’re heading out on. Best part is, even if you got it wrong or the road conditions change, most of what you’ll need to change is your damping, which can be done while you’re riding. Don’t overlook the safety factor here, either. The more accurately your suspension is tuned for each riding situation, the more contact your tires will have with the terrain below. Be it under braking or through turns, every little bit of grip you maintain just might make the difference in a sudden reaction need some day. Comfort, enjoyment, safety, and agility are all factors in our riding success. Next time you get the chance to upgrade to a system like BMW’s ESA, don’t pass up the opportunity.